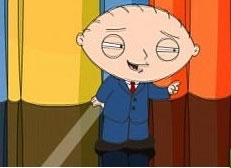 “Up Late with Stewie & Brian” premieres tonight has a sneak peek for you right now. Somehow, in the course of a minute, the sketch manages to poke fun at Steve Harvey, Paul Shaffer and Leah Remini — well, actually it’s her genitalia. Just watch. At Read the rest to click on http://www. for Stewie’s new animated show , talk of the town.. This entry was posted on Sunday, February 25th, 2007 at 9:25 pm	and is filed under Funny Video Clips, Interesting Stuff. You can leave a response, or trackback from your own site.